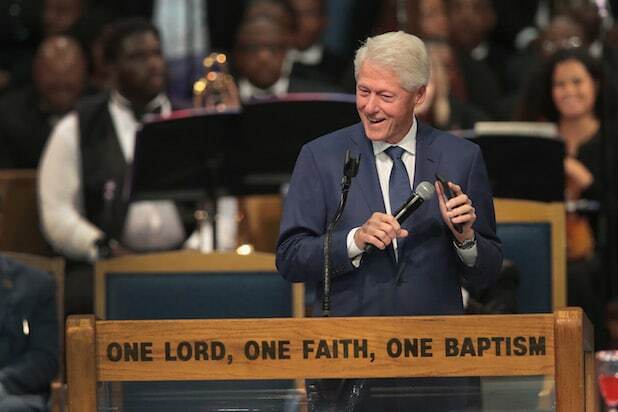 Former President Bill Clinton reminisced about his friend Aretha Franklin, recalling many of his memories of the late singer at her funeral on Friday in Detroit, Michigan. “We started out not as the president, the first lady, the senator, the secretary of state. We started out as Aretha groupies or something,” he said of him and his wife, Hillary Clinton, as he kicked off his speech. Franklin and Clinton go way back — she sang at his inauguration in 1993, performing “I Dreamed a Dream” from the musical “Les Miserables.” She also performed at Barack Obama’s inauguration in 2009. “She worked her can off to get where she was,” said Clinton, praising her work ethic and resilience, even through periods of medical complications. He then pulled out his phone to play her song “Think” through the microphone. The crowd stood up and clapped along. Clinton’s speech was also peppered with light-hearted anecdotes and jokes. “I want to say, I hope God will forgive me, but I was so glad when I got here, and I hope you will forgive me, when the casket was still open because I said, ‘I wonder what my friend’s got on today,” he said to roaring laughter, referencing Franklin’s multiple outfit changes since her death on Aug. 16. Near the end of the speech, Clinton recounted one of his “most enduring” memories of the R&B singer, which he said happened by chance. Many high-profile figures attended Franklin’s funeral, including musicians Smokey Robinson and Stevie Wonder. Ariana Grande and Faith Hill performed near the beginning of the service. Franklin died earlier this month in Detroit at the age of 76. During her career, Franklin won 18 Grammys, including a lifetime achievement award in 1994, and was also the first woman to be inducted into the Rock and Roll Hall of Fame.